Eric Klann and Jerry Brummer had assumed that fractured basalt lied deep beneath the Prineville Airport surface. Brummer, who held a job as the City of Prineville's public works superintendent at the time, had seen a well drilled near the aviation facility in 2006 produce 750 gallons per minute. What's more, the production resulted in little drawdown, and the water source seemed to recharge at a much faster rate than the sandy wells on the valley floor. Its behavior was not unlike wells in the Bend and Redmond area that produced between 2,000 and 2,500 gallons per minute thanks to the fractured basalt beneath the earth. Perhaps the geology beneath the airport was similar. Video footage told a different story. Klann, who joined the city staff as engineer in the fall of 2007, dove into study of the airport area groundwater early in his tenure. Several years of study and drilling of test wells gave way to a moment in 2011 when city staff decided to snake a camera down a bore hole and capture video of the geology. "It was amazing," he said. "Your camera goes down through a casing that's holding the upper portion of the hole open and then as that camera comes out of the steel casing, all of the sudden you are into these river rocks, and it looks like you are in the bottom of a river. You can see that water bubbling sand up and out of the way. That's not something I would have expected right there. That definitely was a big 'ah ha' moment in my career so far." Back in 2006, Prineville was experiencing a period of unprecedented residential growth. A housing boom that gained fame in Bend had trickled into Redmond and ultimately Prineville. The growth was a welcome site in the small community, but it presented local leaders with a potential problem. How would they find enough water to supply all of the new homes? "The city went and drilled three wells (that year) that didn't perform," Klann said, noting that the work came at a $1.2 million expense. One was drilled near the local fairgrounds and ran into sulfur. A second drilled near the high school football stadium didn't work either as "the hole basically washed out on the drill rig." A third attempt was made near the airport, 2,000 feet away from a well drilled in the mid-1990s that was producing 300 gallons per minute despite having a very small liner. It came up dry. "What (Brummer) did to get that additional water is they moved 30 feet away from that (existing well) and drilled an 18-inch hole instead of the 7-inch hole that was there," Klann said. That well produced 770 gallons per minute and got the city out of a tough bind – and city staff gained some early previews about the geological makeup that video footage later revealed. "They looked at the drill cuttings that came up – that was something the city was starting to do – and they noticed they were getting into a lot of fluvial deposits, which are basically just rounded river rocks, sands and cements." When Klann joined the city staff late in 2007, he and Brummer began to dig deeper into why the aquifer produced so well in certain areas, but came up dry a mere 2,000 feet away. They also tried to answer why the drawdown was so minimal and why it recharged so much faster than the wells on the valley floor. They leaned on grants from agencies like Oregon Department of Environmental Quality that enabled them to examine how the groundwater was moving and from what source it was recharging. Then in 2011, the city contracted the services of Newton Consultants and GSI Water Solutions, two expert consultant firms, to drill and collect data on the aquifer. The consultants looked at existing well logs as well as groundwater static levels to determine flow direction and water chemistry in order to learn the origin of the water source. "They looked at all of the existing well logs up in that area," Klann recalls. "When a driller is drilling a well, they have to provide a log back to the state that says what materials they went through, when they hit water, what level the water was – things like that." The research enabled city staff to develop a cross-section of the geological materials beneath the airport, and later, workers drilled three more test wells "to try to triangulate in that area." "We were looking for the edges and center (of the aquifer). That helped us further refine it." But it wasn't until Portland State University graduate student Erin Dunbar showed interest in the airport geology and groundwater that city staff would learn how the aquifer came to exist. Completing work on a master's degree thesis, she asked to conduct her own study of the area. All she needed was $20,000 from the city to help fund the research, a price the municipality was willing to pay as it was just a fraction of what it would cost to contract the work elsewhere. Dunbar scanned the rocks using X-ray fluorescents to determine the origin of the materials and carbon dated all of them. In total, she examined 616 different samples and organized them in rock chip trays that showed what test well they came from and from what depth. She noted that much of the area contained sediments from lava flows as far away as the Cascades and remnants from the Crooked River. 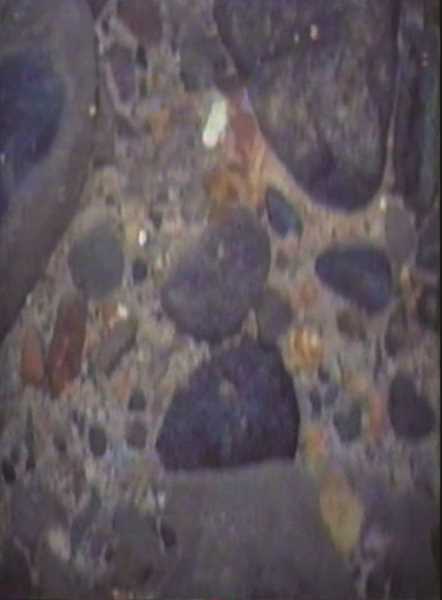 She determined that in general, 130 to 200 feet below the surface is comprised primarily of basalt rock from lava flows. Beneath that, 200 to 400 feet underground, are river deposits that consist of gravel, sand and mud. Below that lies more lava flow deposits. "What we found is 4.5 million years ago, the (Crooked) River was right underneath where the airport office is today," Klann said. "For thousands and thousands of years, the river was in that area. ... Then we had big geologic events come out of the Cascades. We had massive magma flows, and when those flows came through this area, they pushed the river to where it is today and capped all of that existing fluvial deposit." Klann explained that while some people consider the aquifer a type of cavern, it is more similar to a river bottom. The materials are very porous, and while water still moves through them, it can be stored in the location as well. City staff learned that the water is still moving, as it did before the ancient riverbed was buried in magma, but much slower. Conventional river water might move at a rate of around 3 feet per second, whereas the water in the aquifer travels 18 inches per day. Additional study of the aquifer has helped city staff determine the pool of water is about 200 feet in depth, about 500 feet wide and an undetermined number of miles in length. Surrounding it is less porous material that feeds the aquifer from the southwest and continues on to the northeast toward the Crooked River. "For us, it was wonderful to understand the limits of that aquifer and to have confidence that when we drill a well, it is going to produce," Klann said. "Right now, the city has four wells up in that area. Combined, they can produce about 2,500 gallons per minute." Not only did the tightly confined aquifer, with its minimal drawdown and exceptional recharge qualities, provide a robust new source of water for future city use, its unique traits made it a prime candidate for aquifer storage and recharge. "We can take water during the winter when demands are low, store it in the aquifer, and, yes, that blob of water will be moving a foot and a half a day, but then when we turn on our big wells during the summer, (the pumps) will reach out and grab that water and pull it back," Klann said. Such a system is not unheard of as other areas have used aquifer storage and recharge with success, but Klann acknowledges that it is still unique, and Prineville is "doing it in definitely a different geology than it is typically done." City staff moved forward on a storage and recharge system this past year, running large pipes up to the airport area from the valley floor. Apple is funding the $8.7 million project, which will provide the city up to 400 million gallons of water storage in the aquifer once completed. "As we think about the city of Prineville five years from now, 50 years from now, 100 years from now, we want to ensure that we are not mining water – pulling the water out faster than you are recharging it," Klann said. A five-day test run of the storage and recharge system will be conducted this spring, and if all goes well, city leaders hope to launch the new system in time to meet water demands in 2021 and beyond. In the years to come, city staff will continue to drill more test wells in an effort to more accurately define the aquifer and learn its capabilities and limitations. Three more tests are planned for this summer. "Now, whenever we drill a well, we will send a camera down and just look at the geology we are going through. Every 10 feet, when we are drilling, we will take samples and use all of these different pieces of the puzzle to put it together," Klann said. "We are always studying it."